Get ready to give back Chicago! Save the date to take the Champion Challenge and support families of pediatric cancer patients at this one hour fitness fundraising event! All fitness levels are welcome! Treat yourself with libations and light bites at the event-long Celebration. If you can't make the event donations to the Anthony Rizzo Family Foundation are accepted and greatly appreciated. It's time for the downward dog-days of Summer, so try sweating it out at one of this month's pop up classes! Whether you’re winding down the summer, or getting ready to start the school year strong this August intensive will hit the spot. Designed for ages 7 – 15 join us for a mix of climbing, Pilates, games and obstacle courses, we will keep the kids on their toes and having fun. Register before August 15th and receive an additional $25 off each child registered. This comprehensive 6 hour class will teach you the climbers figure 8 knot, good belay practices and basic climbing technique. 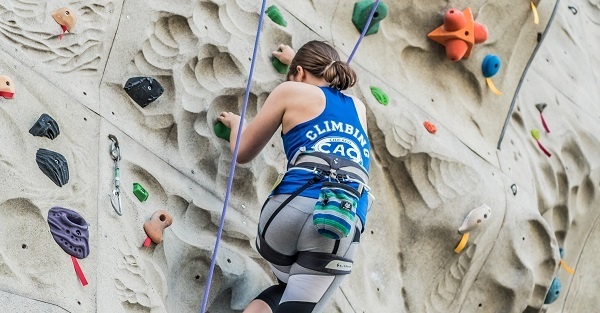 We will get you climbing smart and strong as a certified climber at the Chicago Athletic Clubs. Offer Good for the month of August! So hurry and Register NOW. Ready to dive deeper into your understanding and experience of yoga? Our comprehensive training is for those who aspire to teach and also for those looking to deepen their practice and study of yoga. Launching its fifth decade as one of the country’s leading contemporary dance companies, Hubbard Street brings you a season full of world premieres, choreographic innovation, and international collaborations for 2018-19. Don’t miss collaborations with Emma Portner, Lil Buck and Jon Boogz, Third Coast Percussion, Devonte Hynes (aka Blood Orange), Malpaso Dance Company, and so much more! Learn more about Hubbard Street’s Season 41 programming and purchase your tickets here.